This Tomato Soup is best when you can use fresh tomatoes in season. However, it's almost as tasty, and a bit faster to make, when canned diced, organic tomatoes are used. In a food processor, pulse the tomatoes, 2/3 of the chopped garlic and the bell peppers until coarsely chopped. Scrape the vegetables into the pan and cook, stirring occasionally, for 10 minutes. If using a fresh chili, add the vegetables and saute. Stir in the chicken stock, thyme, remaining garlic and salt. Bring to a boil. Reduce heat to low and simmer for 5 minutes. Season with pepper. The soup can be made ahead to this point and refrigerated for up to 2 days. Heat the oven to 225F. Lay the bread directly on the middle rack and bake for 15 to 20 minutes to dry it out. If it has been refrigerated, quickly bring the soup back to a boil.) Place a slice of bread in the bottom of two soup bowls. Pour the soup over the bread and garnish with fresh basil. To chiffonade, roll some basil leaves lengthwise into a cigar shape. Then slice them crosswise into thin strips. Fluff. The garlic is added in two lots so as to produce two different flavors. 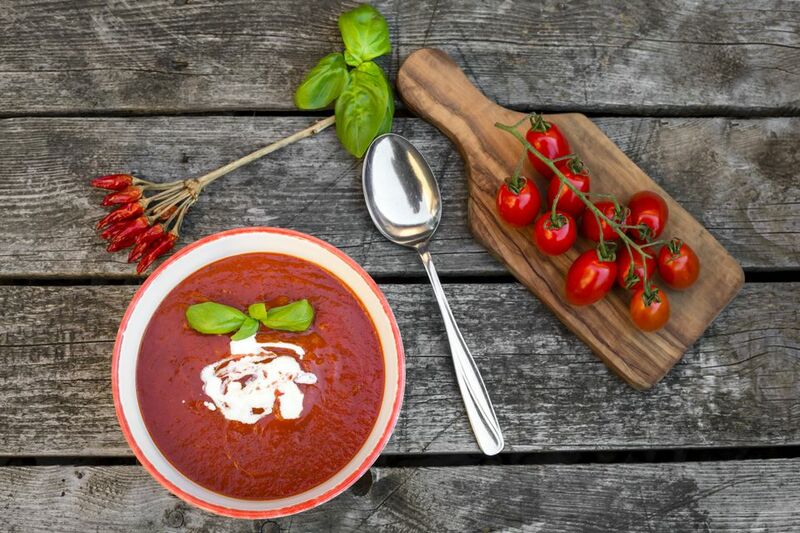 To make this Tomato Soup into a complete meal, simply add some good fresh hearty bread, high-quality butter, an assortment of 1-3 cheeses and a light side salad. Serve with either a spicy red wine, a shiraz or a zinfandel, or a bright white like a sauvignon blanc from New Zealand.